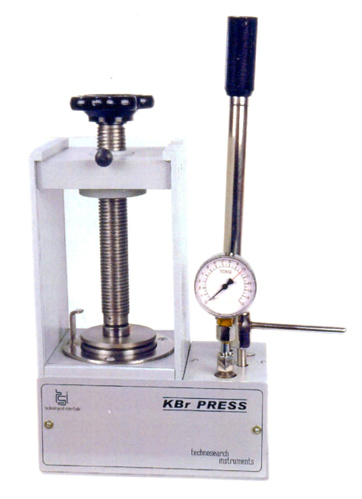 The press is capable of producing maximum pressure upto 30 tons. It is compact in construction & occupies very little bench space. Acrylic screens are provided for the safety of the operator. The base plate has a provision for bench mounting. A pressure gauge for indication of pressure release valve is provided. A telescopic handle is used for extra leverage. KBr Press Model MP-30, fixing bolts for table mounting. Rubber antislide sheet, Oil Bottles -2 Nos., Safety sheets-2 Nos. There are 3 methods by which a solid material is brought to the form acceptable to the instrument.